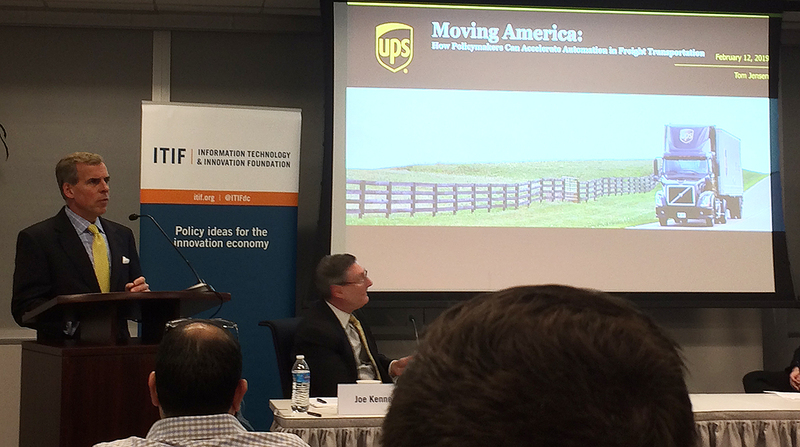 At a panel hosted by the Information Technology and Innovation Foundation, Thomas Jensen, senior vice president of transportation policy at UPS, explained that the inevitable integration of autonomous vehicle technology across the freight industry will be enhanced when a national set of guidelines is implemented, and a patchwork in which states adhere to differing regulations is likely to hinder connectivity. “We don’t like the patchwork. It doesn’t matter what the context is. We need a network, not a patchwork,” Jensen said. Advancements in vehicle-to-vehicle communication, as well as communication between vehicles, infrastructure and pedestrians is capable of minimizing the rate of highway casualties that result from accidents, he said. In 2017, more than 37,000 people died in motor vehicle crashes, the National Highway Traffic Safety Administration reports. UPS Inc. is among the firms testing autonomous, as well as more fuel-efficient, technologies. The company, for instance, is exploring the role drones could play in its delivery operations. UPS ranks No. 1 on Transport Topics’ Top 100 list of the largest for-hire carriers in North America. Joining Jensen on the panel were Greg Rogers, director of government affairs and mobility innovation at Securing America’s Future Energy, and Adrian Arnakis, senior vice president of government affairs at the Association of American Railroads. Arnakis emphasized that restrictions from regulators impede firms’ efforts to develop new systems. “That clearly stifles innovation and our ability to bring on new technologies and new innovation and new automation,” she said. Other companies are testing the technology in Colorado, Georgia, Arizona, Ohio, Michigan and Nevada. Proponents argue mainstream applications are a decade away. Autonomous vehicles are designed to operate without direct human control through GPS or a system of sensors consisting of cameras, lasers or radar. American Trucking Associations President Chris Spear has indicated the adoption of autonomous technology will continue to necessitate essential roles for drivers. Spear has explained industrywide shifts associated with the technology will mostly result in a driver-assist, and not driverless, approach similar to commercial air travel. Recognizing the calls from industry stakeholders, the U.S. Department of Transportation recently published its Automated Vehicle 3.0 policy update. The guidelines for autonomous technology pertain to trucks, transit systems, cars and other modes, explained Transportation Secretary Elaine Chao. The update aims to prioritize safety, remain technology neutral, modernize regulations, encourage consistent regulations, prepare proactively for automation, and protect consumer freedoms. On Capitol Hill last year, lawmakers almost advanced autonomous vehicles policy to the president’s desk. The car-centric legislation fizzled, however, amid security concerns in the Senate. Policymakers are expected to revamp their efforts in the new session of Congress. The bill would have allowed developers to test and market vehicles to facilitate marketplace deployment.